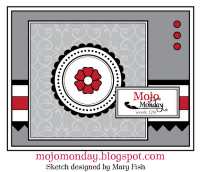 Using Mary Fish's great sketch for the Mojo Monday Challenge, I also made this card for the Raise the Bar Challenge to use the "mug shot" theme and use images of hot drinks. I can't quit using this new DP and while it was on my desk from 2 previous cards, I went for it again. This is a 4 1/4" square card with the BG embossed with the large dots EF. 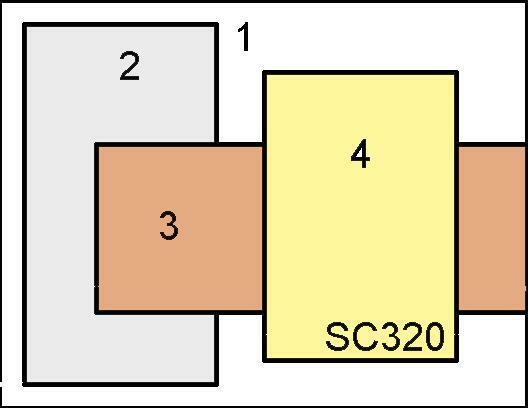 The border is a MFT die. I forgot to stamp the steam image on the mug image...don't you just hate to complete a card and then realize you forgot a great detail?! Off to get ready for work...thanks for stopping by! 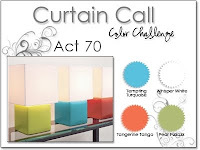 I just had to peek at the TLC & CAS challenges on SCS instead of going to bed! :-( The CAS theme was the great outdoors - flowers and butterflies in this case. This was a quickie to complete. I used a ticket stamp that I had never inked up before because I didn't have a ticket die. I never thought of using a ticket corner punch - DUH! A quick punched butterfly and a quick seam binding bow and done! Oh yes...I forgot about the large dot embossed BG. 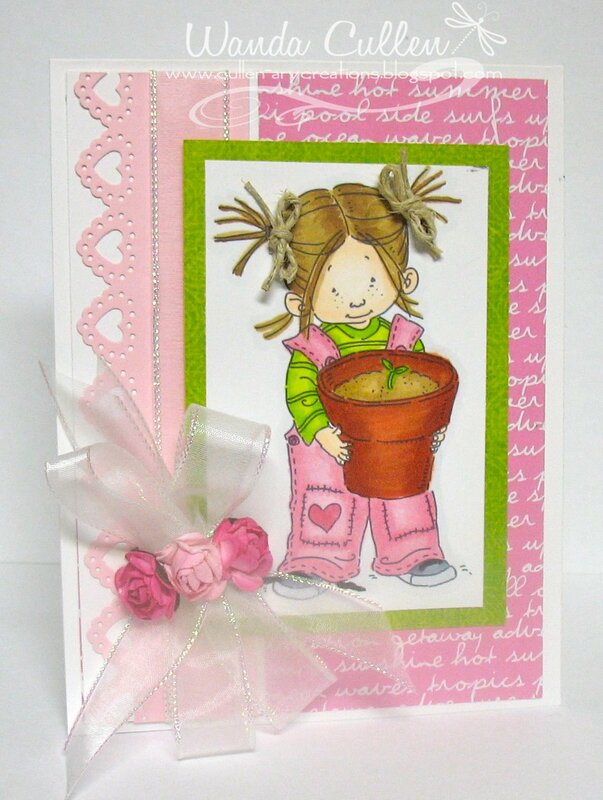 This card is also for the Paper Cutz Challenge to create a spring card. 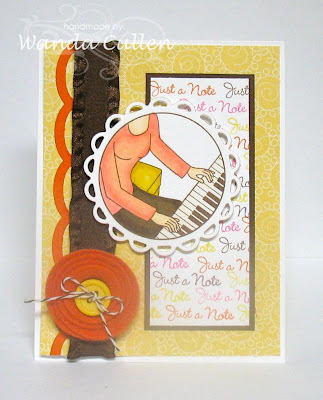 MFT Guest DT Challenge - get Die-mensional and add dimension to a project using MFT dies. Because Karen Giron's wonderful sketch had a circle element, I went to my newest MFT image and combined coloring with Copics and paper-piecing. LOVE this new DP in the SU mini catalog! I layered a white felt rolled flower over a paper rolled rose and accented it with a large SU button and some pale pink twine on a clearance rack at Mike's. 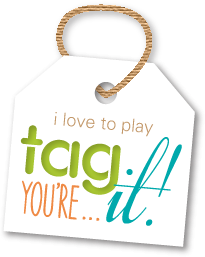 So glad you stopped by...thanks for sharing your comments...I love reading them! Using Amber's great sketch for the Viva la Verve challenge, I created a tropical setting to meet the requirements of the Free 4 All challenge on SCS. Wendy challenged us to honor our island friends (who dress casually for Aloha Friday), so I knew my "go to" sets would be Verve's Relax (palm tree) & Text Objects (ship & sentiment). The rhinestones are orange but for some reason, they show up brown in the photo. 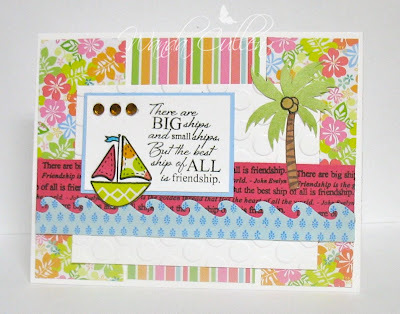 The ship was paper-pieced with Destination Paradise DP by Me & My Big Ideas. The tree was stamped with Certainly Celery and Chocolate Chip (colored with Copic E55). 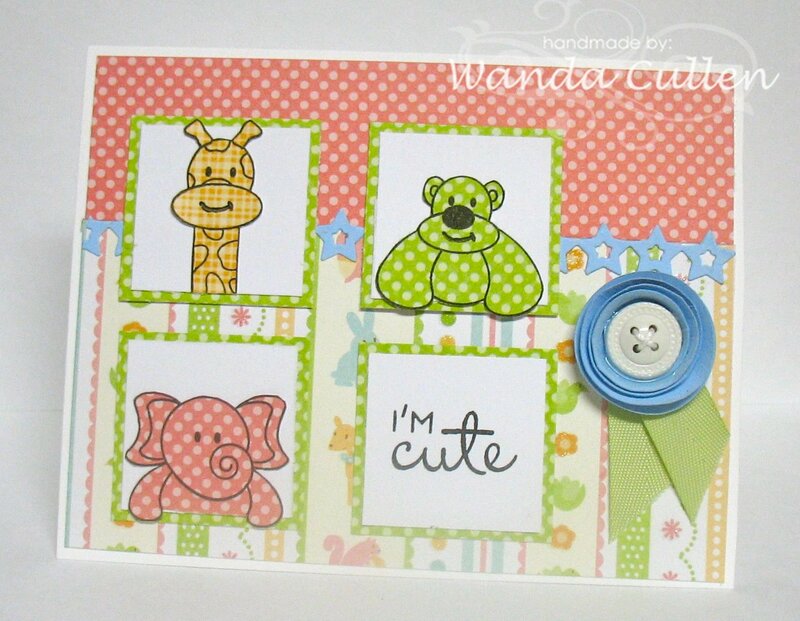 The white panel was embossed with the large dots EF and I just had to use my new MFT Die-namic wave die for the border. TGIF and I have the next 6 days off work - woohoo! Kim wants us to forget about white, brown or black for a card base and go with gray for the Ways to Use It challenge on SCS. I love grays and don't think to use it many times, so this was a great incentive to dust off the gray CS! This is also for the CCEE tool challenge to use a distressing tool. 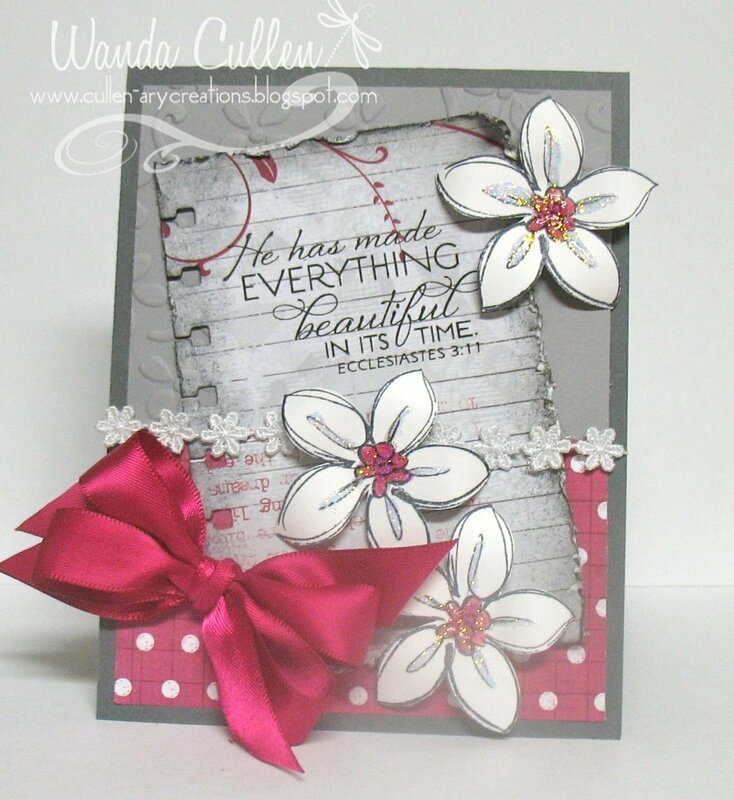 The card evolved when I found this lined, light gray with fuchsia swirls DP by Deja Views in my stash. I used the spiral border punch and sponged Basic Gray ink on the lined panel. The Going Gray base panel was embossed using SU's Elegant Bouquet textured impressions folder. 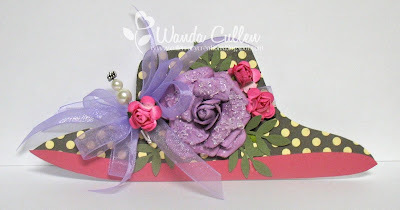 I love to paper sculpt these flowers from SU's Delight in Life set. I curled the edges around a pencil, used Copic markers (R85 & V05) to color the centers, then added some Diamond Stickles. I finished it off with some daisy trim and some satin ribbon. 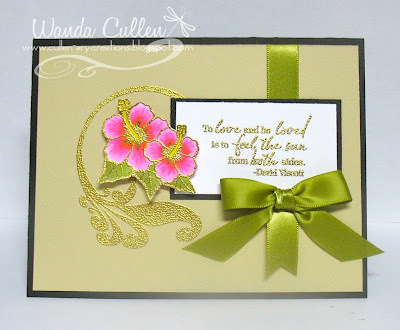 The sentiment is a Plain Jane by Verve - Ecclesiastes 3:11...another of Julee's wonderful font combos. How ironic that it's truly a gray day today...no sun in sight! 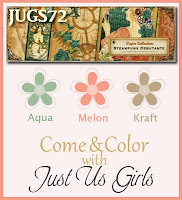 Using the colors from Stacey's Curtain Call Challenge (Tempting Turquoise, Tangerine Tango, Pear Pizzazz, White) and Lea Lawson's layout from Skipping Stones Design, I came up with this fun card. I paper pieced the purse, die cut the doily lace border and added an embroidered floral trim (by Wright's). This retired DP had all the colors I needed with the green being a little brighter than Pear Pizzazz but close enough IMO. Hope you're having a wonderful day...wherever you are! 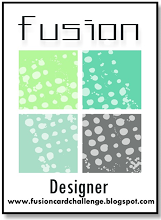 Our Creative Corner - Get wordy! 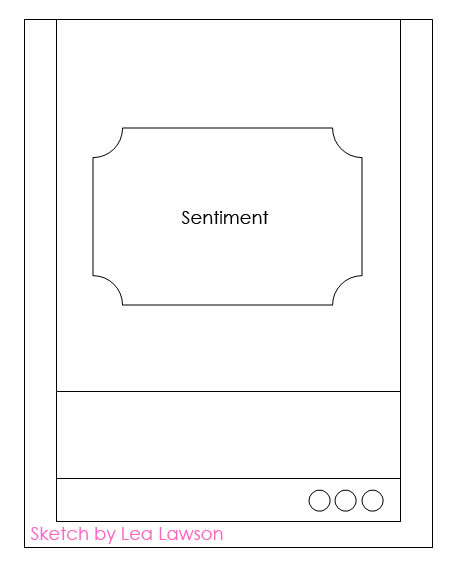 Use sentiment stamps to create a BG by stamping repeatedly. 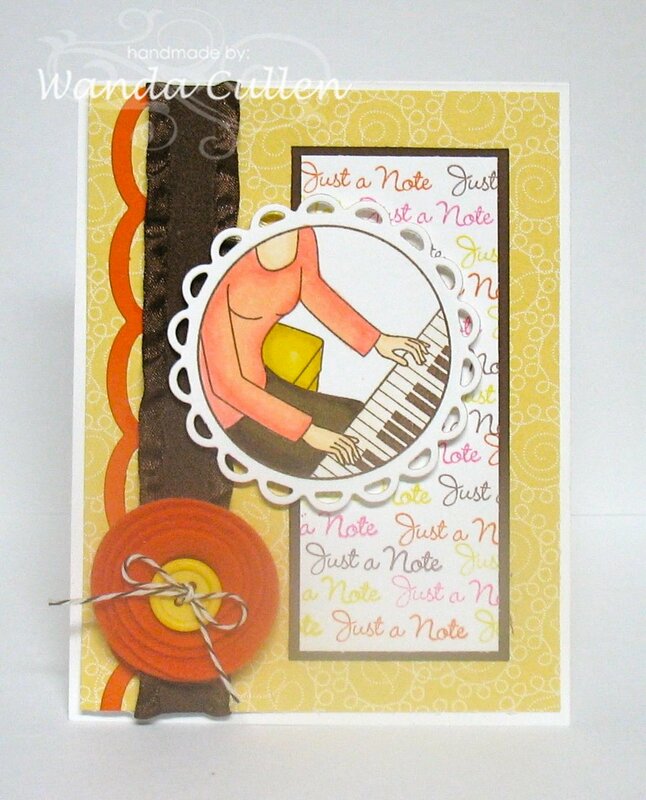 I just got my MFT "Who's That Musical Girl" kit in the mail yesterday, so had to ink it up for the above challenges. Normally I wouldn't do a piano image in chocolate chip, but hey...Liberace probably had a piano with chocolate keys! I repeatedly stamped the sentiment using the CTD colors. The image was stamped using Memento Rich Cocoa ink, then colored with Copics. I had this rolled flower already made in my leftover stash, so a quick button and chocolate baker's twine finished this up. Got to go...time to get ready for work. 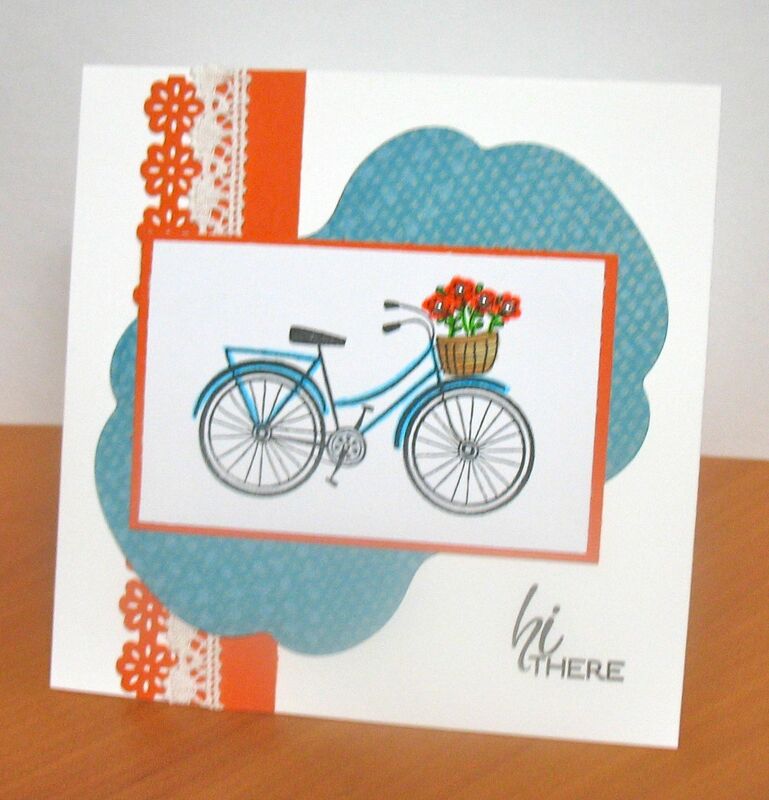 This card is for SCS' Featured Stamper Challenge: Cookie aka StampGroover has the most awesome gallery filled with clean and simple designs! 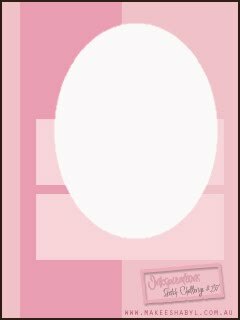 Rather than CASE one particular card, I'm creating this CAS card to honor her style in general. 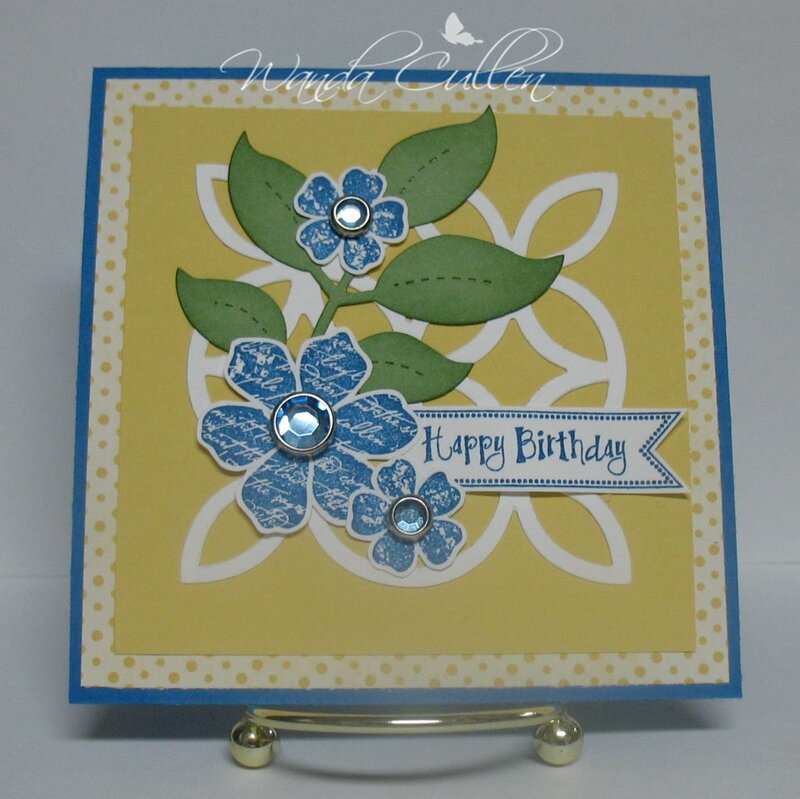 The stamp was quickly colored and tiny silver pearls were added to the flower centers. 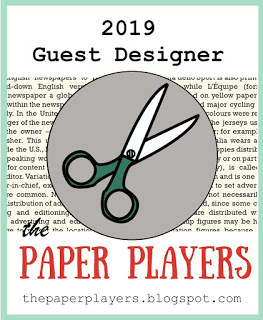 The teapotters are headed to the A-Card-a-Me Awards on the 27th and we're vying for the best of the best in fancy garb or...if the critics so deem...the worst of the worst! You can check out the details HERE. 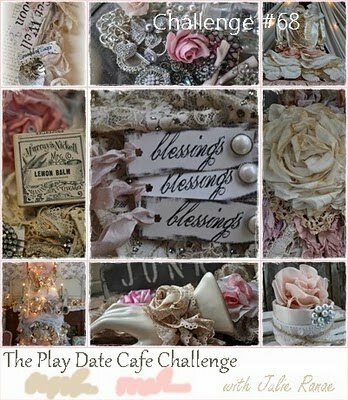 Betty posted the perfect hat colors for the Color Challenge: Perfect Plum, Rose Red, Always Artichoke, Neutrals of choice w/dessert option to use hardware. 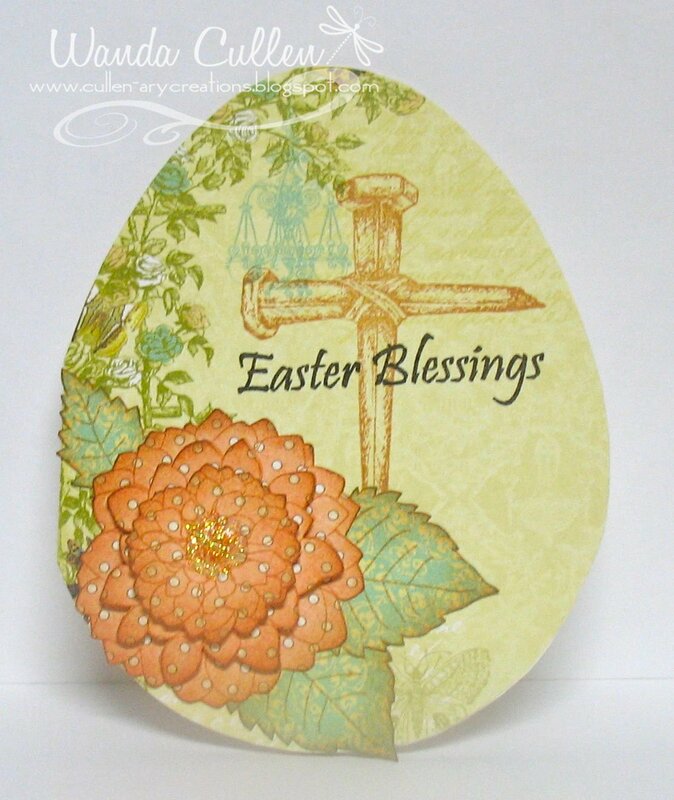 I found a google image and printed it, traced it for the card shape and had a blast decorating it! The polka dots are to honor Mothermark - they're her fave! This week's destination is Lauren...a young actress who has to put her career on hold while she faces some tough medical issues. Hat's off to Lauren! 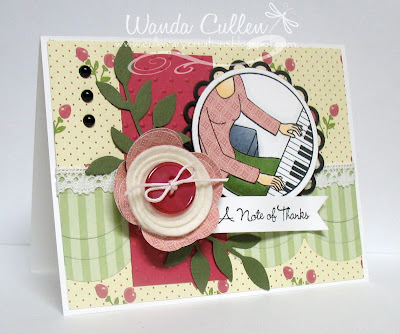 This card is also being entered into Claire's Waltzingmouse Sketch Challenge. 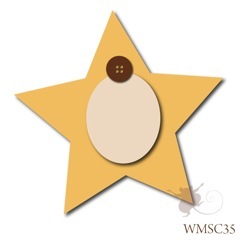 She has a star-shaped card for the inspiration, but I'm using the hat shape instead. 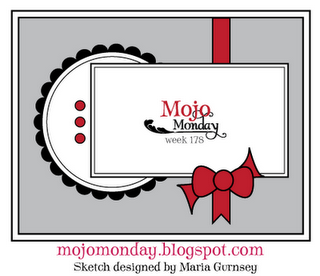 It's Mojo Monday Challenge time and Mary Fish has a great sketch for us this week! I used an old SU color that I haven't used in ages - Cranberry Crisp - to ink the floral image. It matched this new DP by K&Co (Julianne Specialty paper) perfectly. Do I need more paper? NO!...but I'm a sucker for beautiful florals! The leaves and seam binding are Always Artichoke. The circle element is a Martha Stewart tag...just love these for a quick layer...no CB die cutting! I'm off for a fun mother/daughter shopping trip in Charlottesville today...see you all later! The dahlia was stamped with Tim Holtz Tea Dye distress ink, cut out, layered with foam dots and Diamond Stickles added to the center. Edges were also sponged by the same ink. 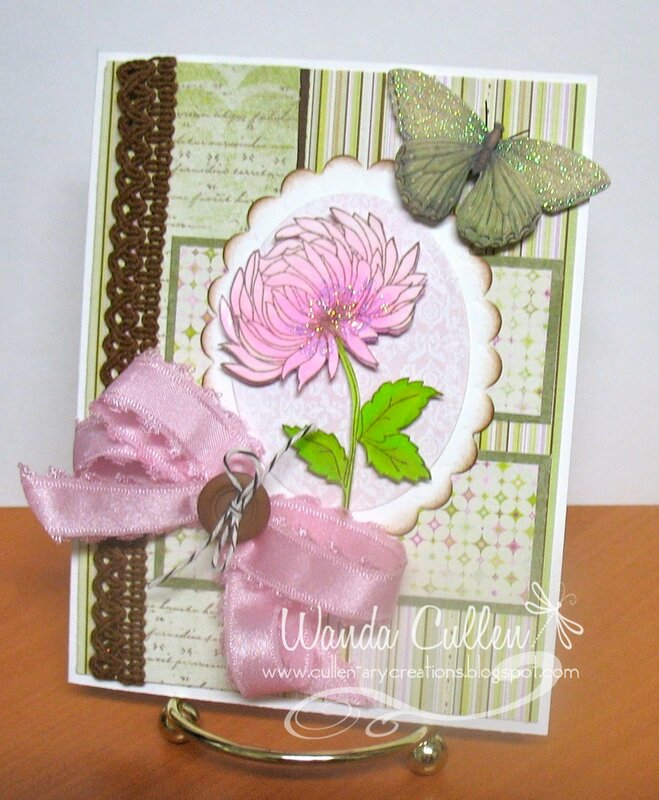 The BG is from Webster's Pages Lullaby Lane & Life's Portrait pad and was layered on Vintage Cream CS which is the card base. 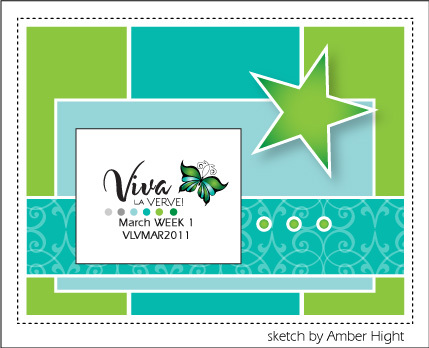 Andrea has a great Viva la Verve Sketch Challenge over on SCS's Verve forum! I intended to keep mine CAS, but I just couldn't resist adding the little roses and bow, since I thought the MS punched border and bling dictated a more fancy, Victorian feel to the card. The vintage cream panel is a 3 inch square punched on each side by the modern garland punch. 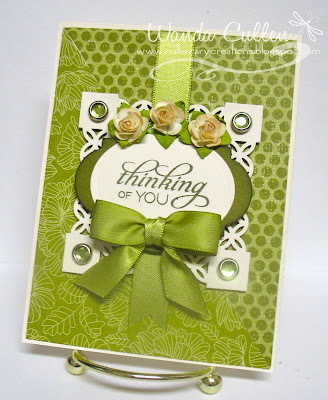 The sentiment is an oval die cut layered over Verve's die cut from Ripe Avocado CS & sponged with Always Artichoke ink. The sentiment is stamped with Always Artichoke ink to keep with the monochromatic look. It's a gorgeous day with temps to go up to 70! 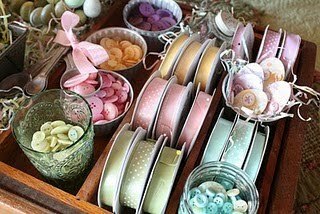 I'm off work and intend to get outside, shop a little and just enjoy this warmth that is so unusual for February! Whoo is in the tree? Well, Whooligan Harry is clutching onto that branch for dear life, because he sees new owls coming to take over his coveted spot! He's about to get debranched! Sorry to mudder for coming late to the party...I hear she's easily bribed by cookies, so I'm coming in the back door and leaving her a great big platter of snickerdoodles! This week, the tea party goers' destination is Marie - sister to SCSer PhilsMom - who has progressive MS and could use some cheer sent her way. She loves owls, so this is to add to the 42,000 owls needed! I colored with Copics and paper-pieced the dress, chomped one corner & the card was done. Hope your day is going great and thanks for looking! 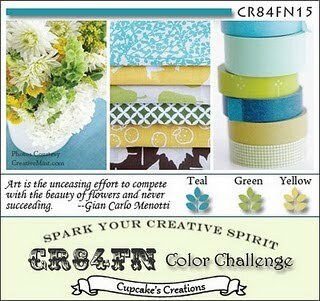 The Color Throwdown Challenge is to use light green, dark green & ballet blue...great spring colors! I used the layout for the MFT Wednesday Sketch Challenge and elongated it so I could accommodate the tree from the DP. The leggings were paper-pieced and the remainder of the image was colored with Copics. 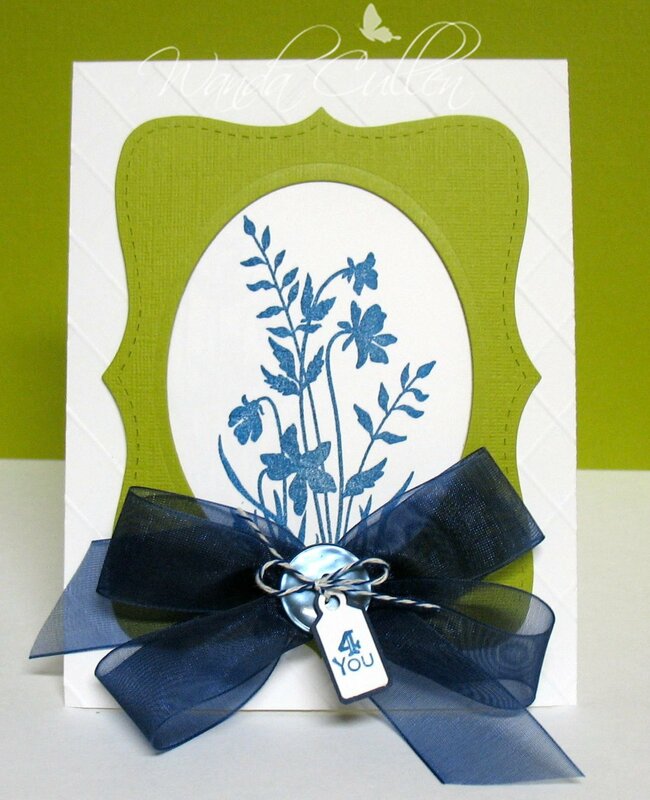 I sponged Always Artichoke ink over Wild Wasabi die cut leaves. I'm still struggling to get a decent looking rolled rose, but I will persist! LOL! ...the more you have the harder it is to find your keys! This is a fun new set from Skipping Stones Design. The images were cut out of different DP from the Modern Homemaker pad by October Afternoon - the bow was paper-pieced. 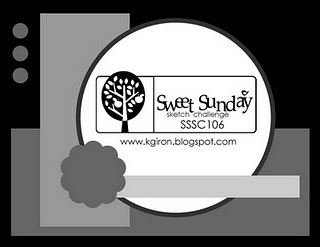 The layout is another of Roxie's great sketches on SCS...check out this week's Sketch Challenge! 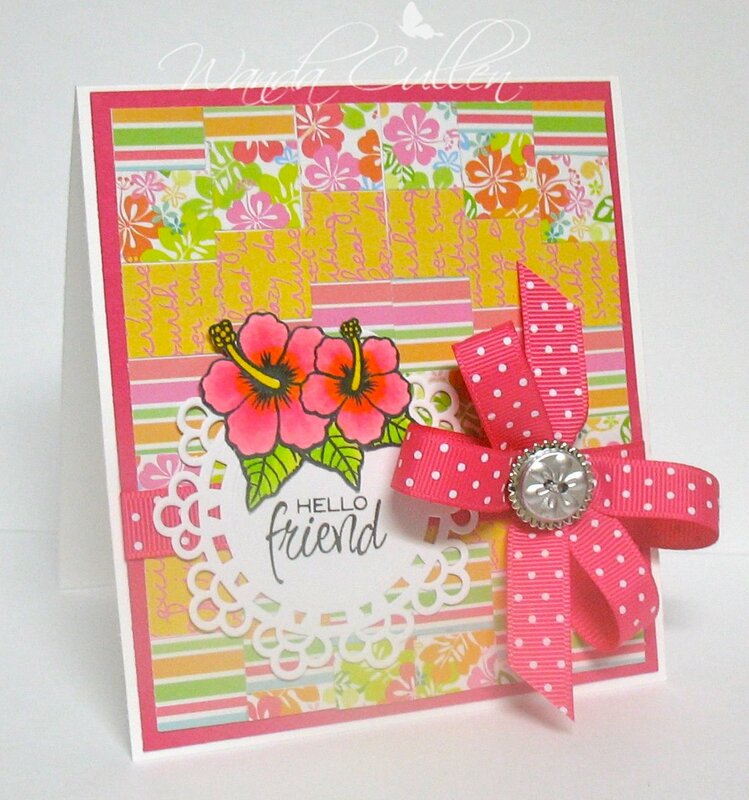 Yes, that's the sentiment on my card for the Get Your Diva On Challenge on the SCS Verve forum...BUT...it's also in reference to my good stamping buddy, Teresa Kline, who's a new dirty girl as of today! I can't believe I was just with her Sunday afternoon and she didn't leak even ONE BIT of a hint that she was dirty!! I'm so happy for her...it's a dream of hers to get that recognition and she deserves it! 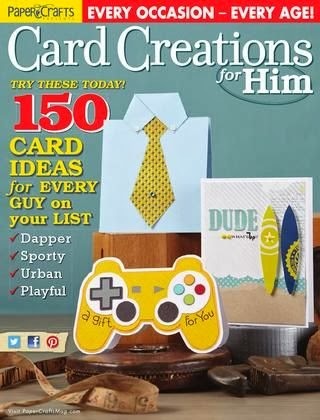 OK...let's get to my card. 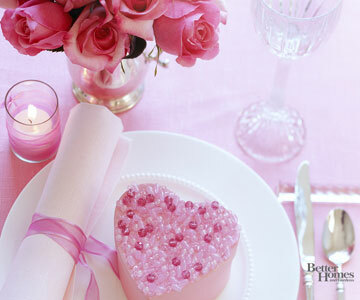 Charmaine posted a beautiful inspiration picture, so I went with the circular elements of the plate, napkin roll, etc. and the soft pinks to create this baby card. 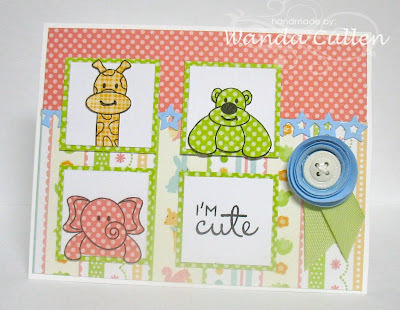 I just love sweet Emery the elephant and he's so easy to color with Copics! 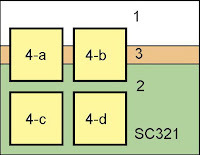 He's popped on a PTI mat stack die with coordinating stamp. 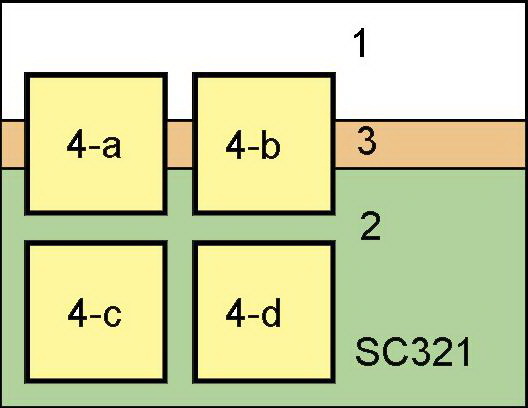 The lower edge is a Tim Holtz edge die called Brackets. 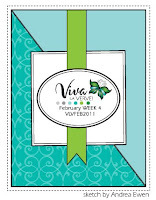 Check out the forum and join in the fun for a chance to be next month's guest Verve diva! Peggy has some wonderful colors this week on SCS's Color Challenge: Wild Wasabi, So Saffron, Pacific Point. 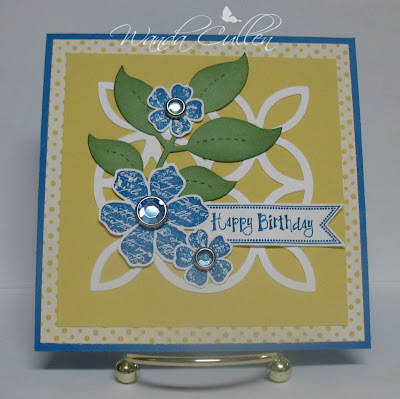 This card came together quickly with a die cut lattice BG and die cut leaves which I sponged the edges using Wild Wasabi ink. 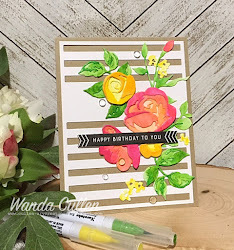 The flowers were stamped in Pacific Point and cut out...using my trusty new Tim Holtz Tonic scissors...comfortable padded handle and cuts like buttah! Can't you just hear Paula Dean saying that? 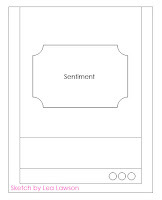 :-) The sentiment flag is from the set created by Laura Pryor (Lil Inker Designs) and I find myself using it quite often. The gemstone brads are by Recollections (found at Michael's). DP is Tea Party by SU. It's after midnight, so have to check out the new dirty girls on SCS! Maria Gurnsey has a fabulous Mojo Monday sketch this week! 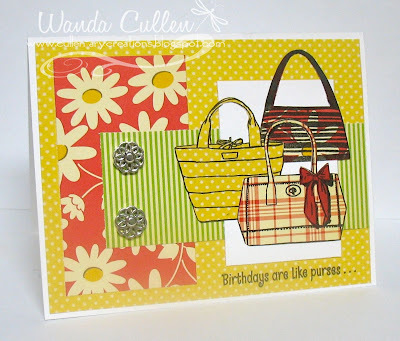 I kept my card CAS and gold embossed the circular image from Verve's Happy Days set. 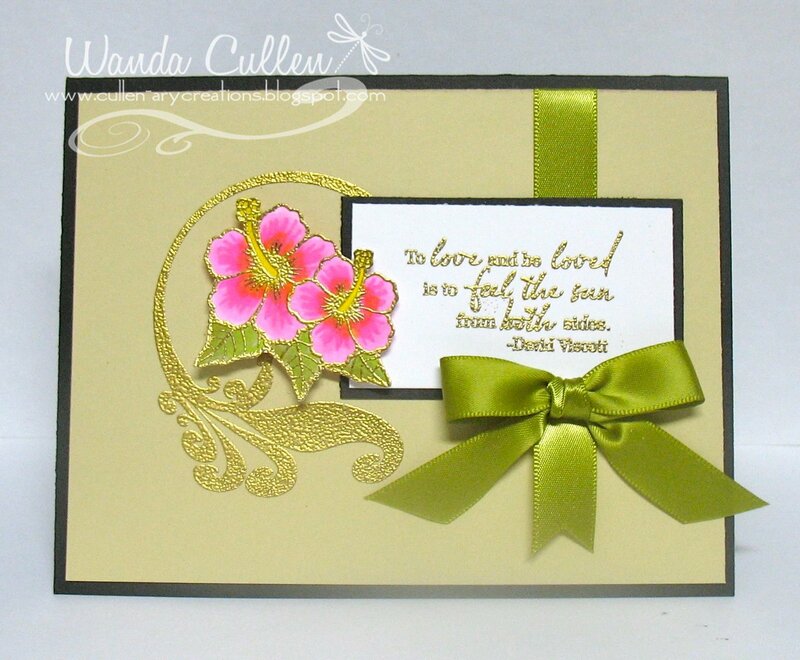 The sentiment, also gold embossed, is from Verve's Feel the Sun set. The flowers were colored with Copics, cut out and popped with dimensionals. Hope you're having a wonderful Monday....it's already in the upper 50's and it's only 11:00 AM! Now that's some great February weather! 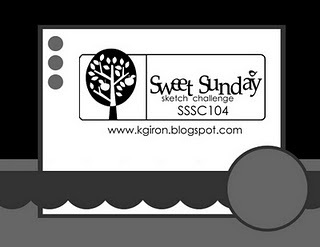 I started by flipping Karen's sketch, so I could use this digi image by Mo's Digital Pencil - one of the images for the Katie Renz fundraiser. I colored this sweet image with Copics and added some twine to her pigtails. A punched border, some primas and ribbon finish up this girly card. 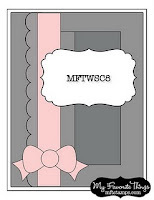 Our Creative Corner - cut it out. 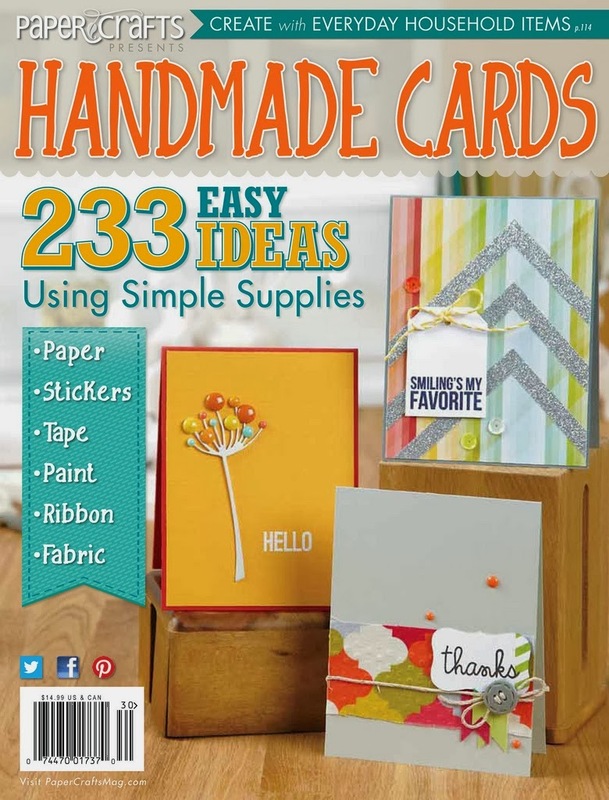 The stamp set was a bargain find at TJ Maxx as I was in the checkout line...an acrylic stamp set by K&Co for only $2.00! I colored the lotus with Copics (RV00, RV02, YG03, YG06, YG93), cut it out and popped it with dimensionals. Diamond Stickles were added to the center. The butterfly is a sticker by K&Co. I'm going to check out what's happening in Daytona next...should be interesting to see the new changes in Nascar this year. 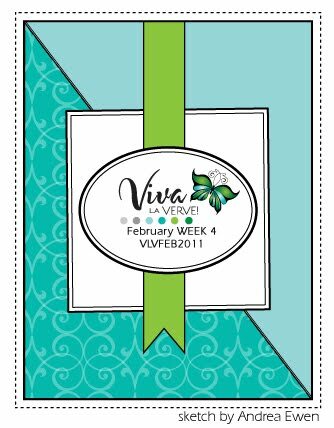 I really didn't need another Valentine card, but it just seemed to work out that way when I saw Teresa Kline's great sketch for the Viva la Verve challenge on SCS's Verve forum. I found this heavy, glittery red CS at Mike's last week and wanted to die cut it using the Verve heart die. 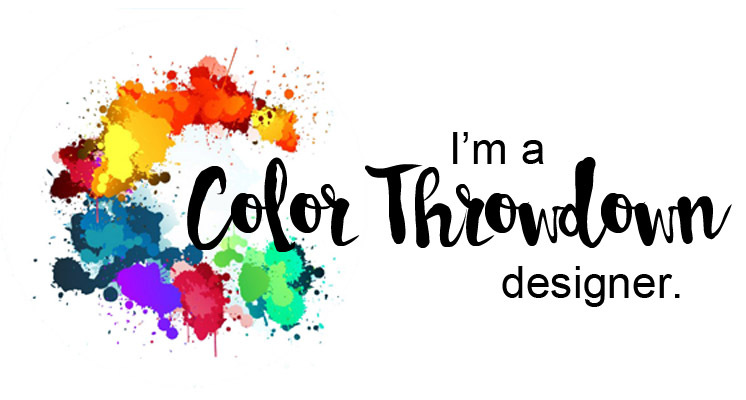 I kept it CAS, adding the sentiment on a banner die from Lil Inkers. This was the first time I inked up this little sentiment and I've had the set for over a year...qualifying this for Jessie Rone's Forgotten Stamp Friday challenge. 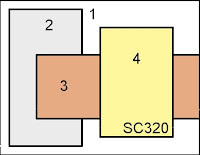 This is also for the Free 4 All challenge on SCS to use a royalty theme using reds, purples or golds. 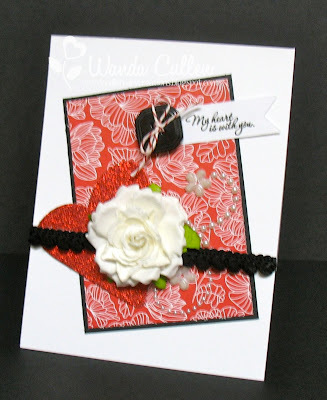 I chose red and added pearl bling along with the sparkly heart to create the 'royal gem' feel to the card. Plus, it seems the queen is always holding roses in pictures, so this is a rose for the queen! 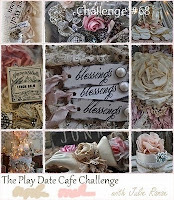 My friend and SU demonstrator, Deb, is hosting a new Last But Not Least challenge on her blog this year. 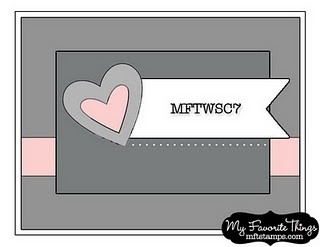 January's challenge is elements of one - 1 mat, 1 stamp, 1 ribbon, 1 button, 1 sentiment. There will be a prize offered each month and this time you have a chance to win a bag of buttons. I wanted to make this a SU only card, so inked up the wildflowers image from Just Believe. 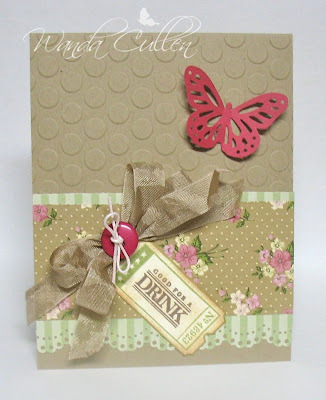 The single mat is a top note die cut from textured Kiwi Kiss CS. The bow is retired Night of Navy sheer ribbon with the sentiment tag from their Tiny Tags set - one of my faves. I just realized that the twine to hold the button to the bow is not SU - it's from PTI. Well, it's almost entirely SU - lol! I scored a portion of the BG up to the die edges. 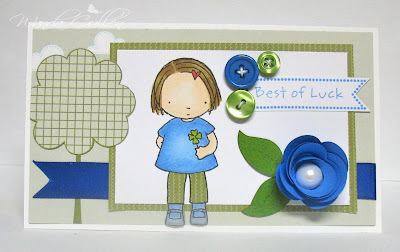 Hope you stop by and play along with Deb! She'll post a new challenge on the last day of each month.